St. Peters on the wall (Saxon chapel), Bradwell-on-Sea. 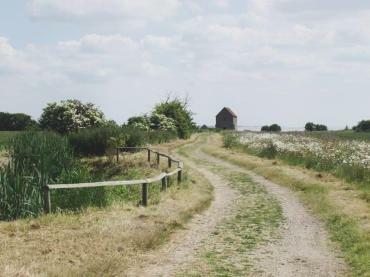 Looking along the footpath to the chapel, the small building on the skyline, which may be reached by turning down the lane next to the church in Bradwell village and following it to its end. The start of the footpath is obvious. This area is a delightful place on a sunny day being on the very edge of the River Blackwater estuary and well away from any habitation. Bradwell's full name, Bradwell-on-Sea, is really a misnomer as the nearest water is over a mile away and that is the River Blackwater estuary not the sea. 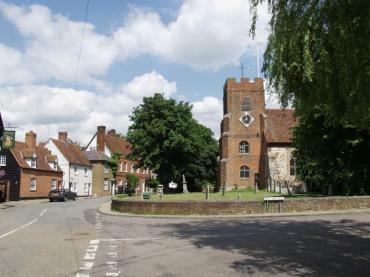 The church of St.Thomas, seen on the right of the picture, is mainly 14th century with later alterations. The brick tower, for example, was built in the 18th century. This road junction is the start of East End Road which leads to St. Peter's Chapel. 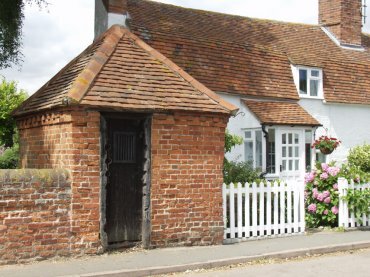 The old village lockup was built in 1817 to house people arrested by the Parish Constable. Stocks and a pillory were added later. This small building was intended to house up to six people - very cosy. 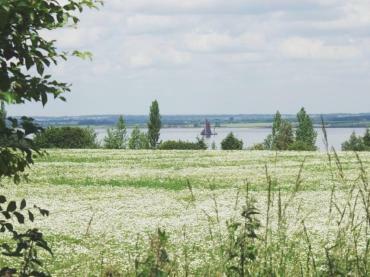 A view of the River Blackwater from the Maldon to Bradwell road showing a Thames barge under sail heading for Maldon. 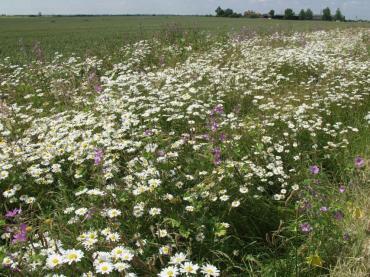 Oxeye Daisy (Leucanthemum vulgari) and Common Mallow (Malva sylvestris). This photograph was taken, from the path to St. Peter's Chapel, in the latter part of June.